The novel begins in 1948 and ends some four decades later. Yigal is a warrior, a lover, a winner, and a loser. The dearest of all besides his wife and child was the diary of Esther. This diary makes the book! It is a love story of young people caught up in the struggle of establishing a new nation. 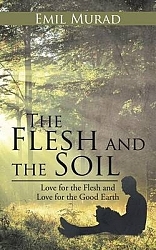 The Flesh and the Soil is a saga covering about almost the most crucial wars a country in the course of creation has suffered. The diary will take the reader to a past that scorns burial. It is a warm and a beautiful yet grotesque, whimsical, and intricately interwoven love story like the trunk of a thousand-year-old tree that has its roots hundreds of meters deep into the soil and its leaves and branches lifting their heads up to the sky. It is love for the flesh, love that binds peoples from all over the world, and love for the good earth, which lives long after these people pass away!